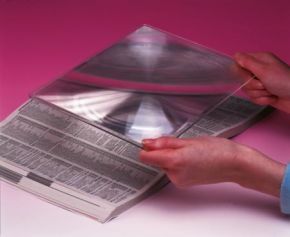 The Plastic Sheet Magnifier Has 2 x Magnification. Do you strain your eyes when you're reading or doing crafts? There really is no need. This handy magnifier sheet can be positioned to magnify either flat or at an angle, allowing you to easily read newspapers or books comfortably without squinting or hurting your eyes. It has 2x magnification that makes it easier to see small print or even intricate detail making it perfect for crafts such as needlework or modelling. This sheet magnifier can easily be stored away flat and is easy to travel with. As it's made from durable plastic, this item is strong, sturdy and lightweight.